Smart thinking: Councillor Roger Bennett with PCSO Tomas McCorry. IN a new bid to crackdown on crime, County Councillor Roger Bennett is launching a campaign for residents to receive free Smatwater kits in Headless Cross and Oakenshaw. Supported by West Mercia Police and Crime Commissioner John Campion, the aim is to help local residents prevent crime in their homes. The scheme is also being backed by Inspector Mark Chappell from the Police Safer Neighbourhood Team. 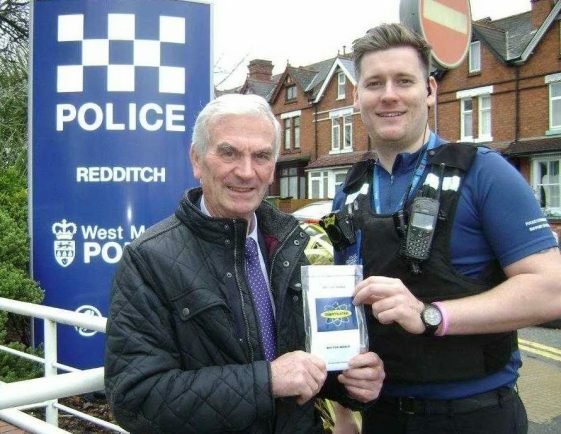 Coun Bennett (Con, Redditch South) is funding the free Smartwater kits from divisional funds allocated to him by Worcestershire County Council. Police and Crime Commissioner John Campion said: “Smartwater is proven to prevent burglaries, and it is already acting as an extremely effective deterrent across West Mercia. “By protecting these additional homes in the areas of Headless Cross and Oakenshaw we are working to make even more people feel safe and secure. Assisted by PSCO Tom McCorry and his team, Coun Bennett will be visiting residents during the week starting Monday, March 19. Smartwater Kits will be made available for collection from St Luke`s Memorial Hall, Evesham Road, Headless Cross, B09 4JX on the following days. Thursday, March 22 – 1.30pm to 5.30pm. Friday, March 23 – 1.30pm to 5.30pm. Saturday, March 24 – 10am to 5pm.